214 (29 July 1944), 215, 216, 217, 224, 225, 227, 228, 230, 233, 234, 239, 240, 241, 243, 244, 245, 247, 249, 250, 251, 252, 255, 258, 260, 261, 266, 267, 268, 269, 270, 271, 272, 273, 274 (20 Nov 1944). For Mission dates, targets and Mission Reports, see Combat Missions. 1Lt Franklin F. White (P) - All of his 35 missions flown as First Pilot. First two missions flown with an experienced combat orientation CoPilot, 2Lt John R. Helms. Combat tour (35 missions) completed on 20 Nov 1944 (Mission 274). 2Lt Wallace A. Clines (CP) - Flew no combat missions with the 1Lt White Crew. Flew two missions as CoPilot with Lt Telesphor Lojewski (214, 215). 2Lt Clines Was hospitalized and flew no more combat missions. 1Lt White flew with fourteen different CoPilots: Lt John N. Petersen - 16 missions (217, 224, 227, 230, 233, 240, 241, 243, 244, 245, 249, 250, 251, 260, 261, 267); 2Lt John R. Helms - 2 missions (214, 215), 2Lt Harry E. Hopkins - 6 missions (269, 270, 271, 272, 273, 274); Eleven other CoPilots who flew on a single missions with the 1Lt White crew. 2Lt Seymour Kaufman (N) - Flew on 23 missions with 1Lt White (214, 215, 216, 217, 224, 225, 227, 228, 230, 233, 234, 239, 240, 241, 243, 244, 245, 247, 249, 250, 251, 252, 255) and 12 missions with other seven other Pilots (273, 274, 275, 277, 279, 280, 281, 287, 294, 296, 297, 298A). Combat tour (35 missions) completed on 6 Jan 1945 (Mission 298A). 1Lt Robert M. Ross (B/N) - Flew on 34 missions with 1Lt White: As Bombardier (25 missions - 214, 215, 216, 217, 224, 225, 227, 228, 230, 233, 234, 239, 240, 241, 243, 244, 245, 247, 249, 250, 251, 252, 255, 260, 261); As Navigator (9 missions - 266, 267, 268, 269, 270, 271, 272, 273, 274); As Navigator with 2Lt William H. Woodson (275). Combat Tour (35 missions) completed on 21 Nov 1944 (Mission 275). T/Sgt William J. Adams (E), S/Sgt Frederick S. Gilman (BTG), S/Sgt Monroe C. Hein (WG) and S/Sgt James R. Campbell - Flew all of their 35 combat missions with 1Lt White. Combat tours (35 missions) completed on 20 Nov 1944 (Mission 274). S/Sgt Henry L. Vesely (R) - Stood down on one mission (241). All other missions with 1Lt White. Completed 34 combat missions on 21 Nov 1944 (Mission 274). Sgt William H. Crumpton (WG) - Flew no 303rd BG(H) combat missions. 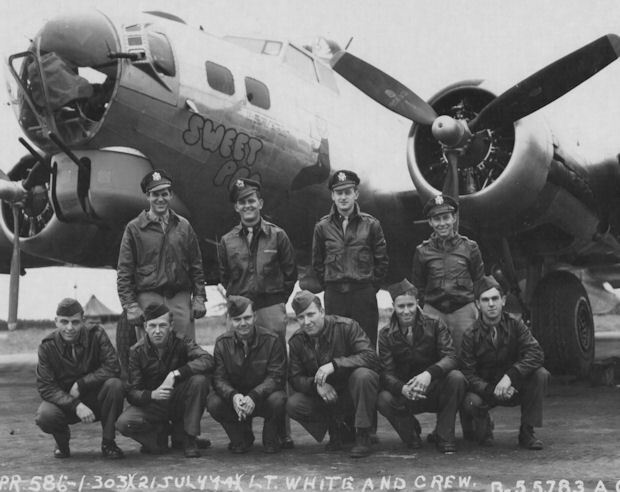 Deleted from 1Lt White crew before the crews first mission. A 303rd BG(H) directive mandated crews to fly combat missions with a single Waist Gunner.